Table 3-2. Note: Includes all calls dispatched, including cancelled en route. Figure 3-3 depicts annual incident volumes by type and year. Incident types were placed in three categories: fires, EMS, and others. The data show that overall demand for service has declined by 14.7% since 2009. Much of this can be attributed to a change in the EMS dispatch protocol. Beginning in 2013, BFD was no longer dispatched to certain requests for “emergency” medical care in which it was unnecessary for a fire department response. Incidents of fires and other calls have remained relatively steady over the last 60 months. Additional analysis of BFD’s incidents showed no significant statistical differences in call volumes when considering day-of-week or month-of-year. 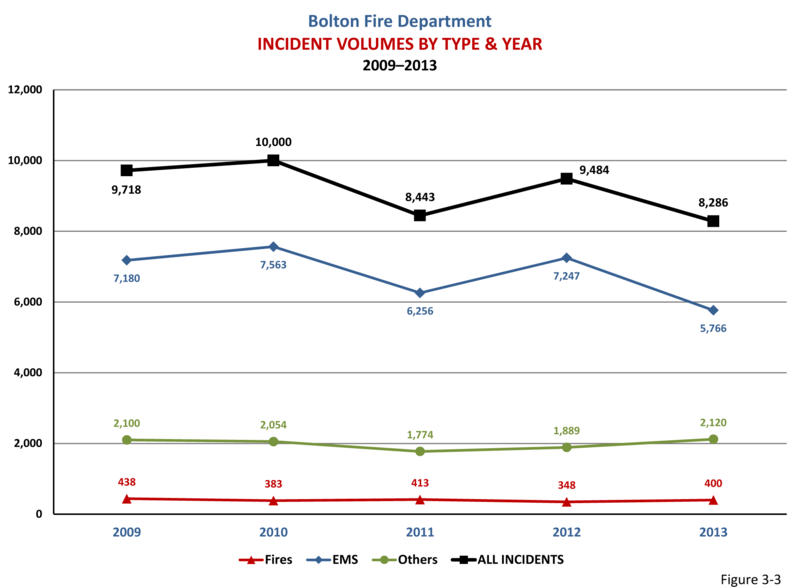 The conclusion drawn is that the department’s call volume by incident type remains consistent throughout the year. The frequency of incidents, by hour-of-the-day, is analyzed for the purpose of predictability. The busiest periods for BFD is between the hours of 0800 (8:00 am) and 2000 (8:00 pm) daily. These times are consistent among all incident types. An analysis of fire incidents categorized within the NFIRS 100 series was conducted to determine a more detailed insight. Table 3-3 lists the top five most frequent fire-related incidents, by year, during 2009–2013. As shown, building fires, cooking fires, and passenger vehicle fires were the three most common. Nearly 70% of building fires occurred in 1- or 2-family dwellings or multifamily dwellings. About 60% of these originated in the kitchen area and extended to other rooms. 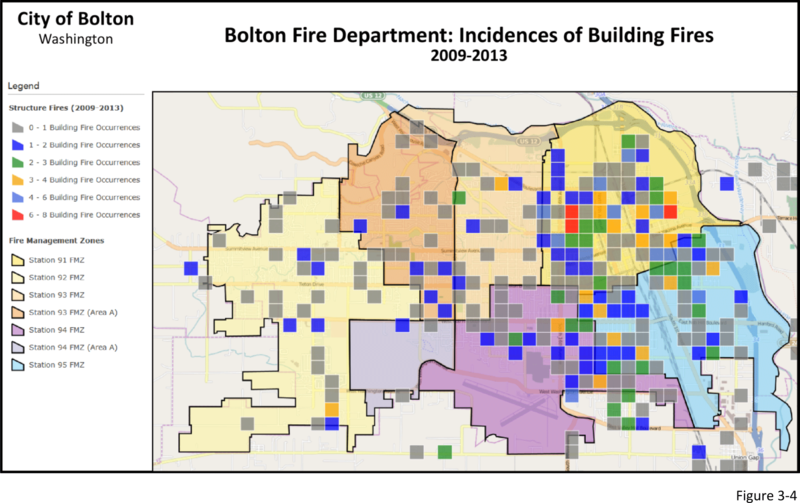 The other 30% of building fires occurred in a wide variety of property types. 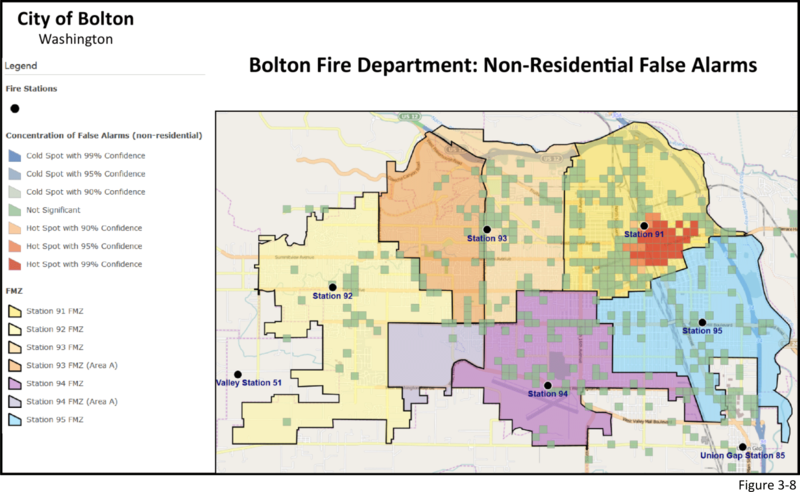 As shown in Figure 3-4, the majority of building fires occurred in the northeastern portion of the city, within Fire Management Zone 91. Cooking fires without extension (NFIRS 113) represented the second most frequent types of fires. 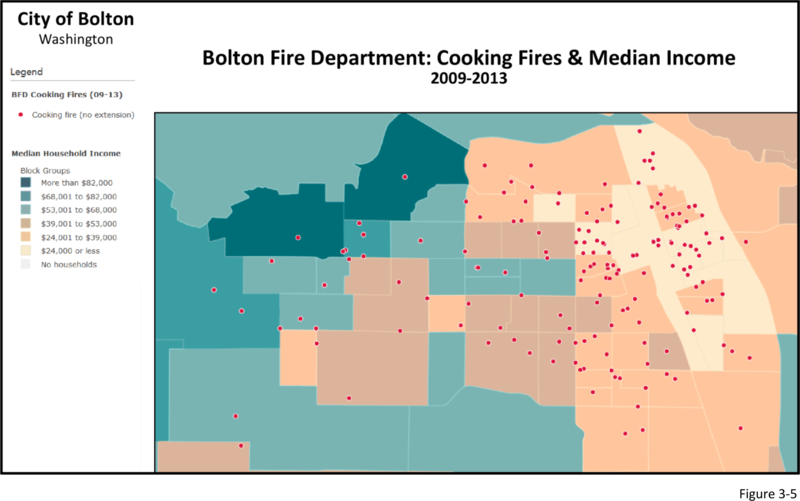 When combined with building fires originating in the kitchen, cooking-related fires represent the most significant types of fires within the City of Bolton. Figure 3-5 illustrates that the majority of these occur within the eastern and northeastern portions of the city, primarily in households with a median income of less than $24,000 annually or between $24,000 and $39,000 annually. Further GIS analysis showed that the majority of cooking fires (without extension) occurred predominately in Hispanic, Spanish-speaking residences among median ages of 27.1–35 years and 27 years or younger. These results are consistent with building fires originating in the kitchen. In approximately 55% of cooking fires without extension, and building fires originating in the kitchen, that a smoke alarm was either not functioning, did not alert the occupants, or none were installed in the residence. The frequency of brush fires (NFIRS 142) and passenger vehicle fires (NFIRS 131) over the previous five years are approximately the same, and represent the third and fourth highest number of incidents. However, when combining the number of brush fires with other incidents categorized as wildland-types (grass fires; forest, woods, or wildland fires; grass fires; natural vegetation fires), the incident-count increases to substantially. Thus, wildland-type fires were the second most frequent fire-related incidents. Of all the combined wildland-type fires, the majority (26%) occur around 1- or 2-family dwellings; 20% in open lands or fields; and 15% in vacant lots within residential neighborhoods. 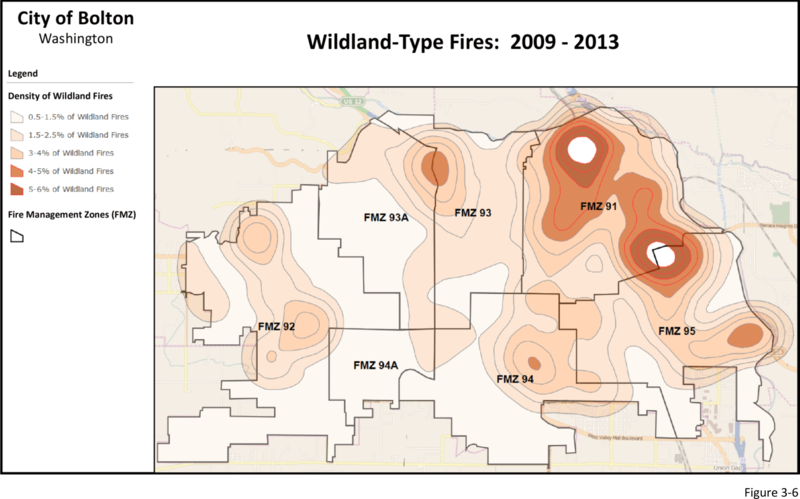 Figure 3-6 illustrates the density of wildland-type fires by location. The map shows that most occur in the eastern and northeastern portions of the city, in the residential neighborhoods of FMZ 91 and 95, followed by FMZ 93. Incident records indicated that during 2009–2013, there were a total of 41,706 patient encounters (consisting of 34,012 separate incidents); resulting in an annual average of 8,341. Patient gender consisted of 54% males, and 46% females. Ages ranged from less than 1 to 105 years, with an average of 54 (mean 55). Female patients averaged 56 years, and males 52. Individuals aged 16 or younger, comprised 7.4% of the patients. The NFIRS categories give a very broad description of most EMS incidents, but are inadequate in describing more specific details of illnesses and injuries. For example, the majority of EMS incidents were categorized as 321–EMS call (includes patient refusals). In order to get a more complete perspective of EMS, it was necessary to examine patient records greater detail. This was done by evaluating the primary impressions and causes of each case. Figure 3-7 shows that the most frequent primary impression involved traumatic injuries (27%); followed by chest pain (13%), altered level of consciousness (11%), and abdominal symptoms (8%). The data showed that 28% of traumatic injuries were a result of a fall. Of these, the majority were ground-level falls involving female patients 62 years of age or older. 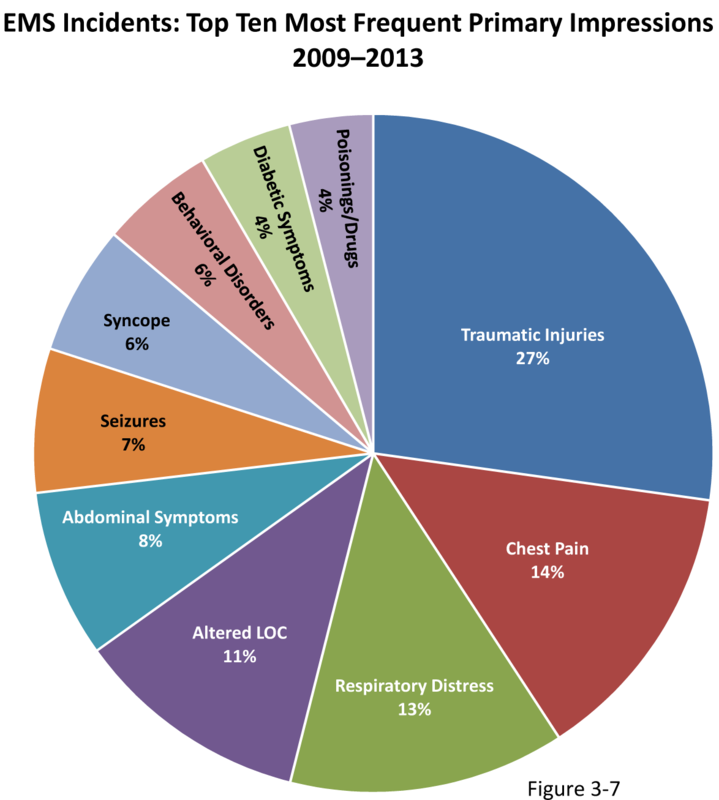 Non-traumatic cardiopulmonary arrest cases represented a relatively small number of EMS incidents. Most occurred at home, and approximately 25% presented with an initial rhythm of ventricular fibrillation. About 20% of all arrests occurred in public locations. However, there were no cases in which an automated external defibrillator was available or deployed. After excluding fires (NFIRS 100) and EMS (NFIRS 300), the remaining types were place in the “Other Incidents” category. Table 3-5 lists these in order of quantity. The top three other incidents (NFIRS 600, 700, 500) represented 20% of all incident types in which BFD was dispatched over the last five years. Within each of the NFIRS categories are subcategories that provide a more specific description of the incident. Within the NFIRS 700–False Alarm & False Call category, 745–Alarm system activation (no fire), unintentional represented the most common. False alarms occurred most frequently in single- and multi-family residences (35%), followed by public schools (9%), and hotels/motels (6%). Figure 3-8 is a map illustrating the concentration of non-residential (primarily commercial) false alarms within the city. The majority of these occurred within FMZ 91, and in the downtown area. A substantial percentage of the “assist invalid” incidents occurred in nursing homes and retirement facilities that provide 24-hour care and/or assistance.